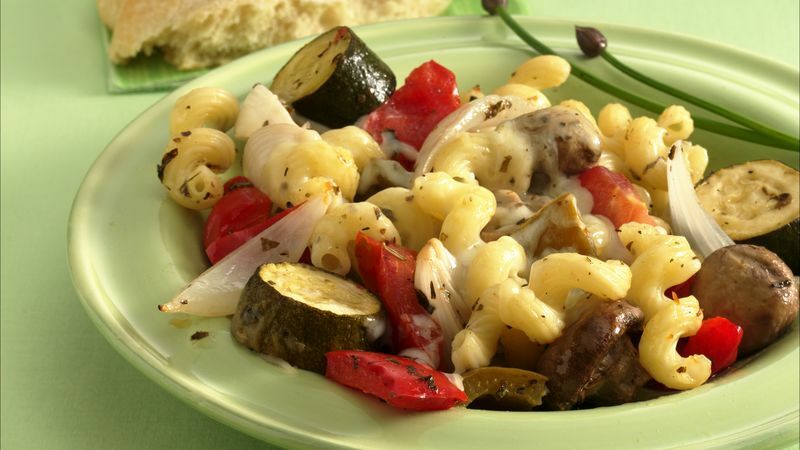 In 15x10x1-inch pan or shallow 3-quart casserole, place bell peppers, onion, zucchini and mushrooms. Sprinkle evenly with basil. In small bowl, mix oil, vinegar, Italian seasoning, salt and pepper; drizzle evenly over vegetables. Bake uncovered 25 to 30 minutes. Reduce oven temperature to 350°F. Add tomatoes and pasta to vegetable mixture; toss to coat. Sprinkle with cheese. Bake uncovered about 15 minutes longer or until vegetables are tender and cheese is melted.